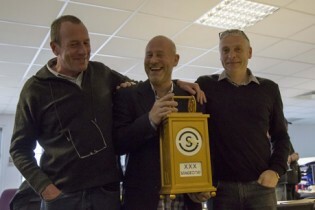 After thirty years at Stage One, Sales Director Simon Wood has retired. 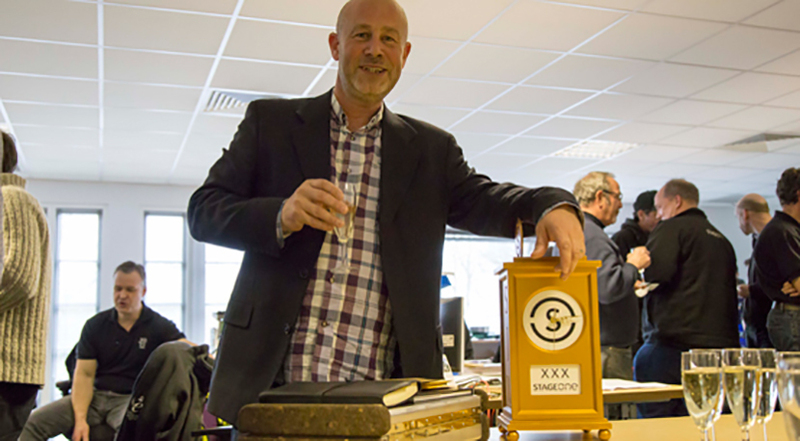 We toasted his long service and dedication to the business with champagne and canapes last Friday, as well as presenting him with some very special ‘Stage One’ gifts, including a specially made carriage clock and in tribute to his artistic background, a case of artists’ brushes. Simon, or Woody as he is affectionately known throughout the business, was one of the founding directors of Stage One, alongside Jim Tinsley and Mark Johnson. His contribution has been invaluable in cementing the relationship between creativity and innovation which makes our approach unique and our projects so diverse. He’ll not only be missed in the Stage One offices and workshops, but also by the legion of clients and suppliers who sent their best wishes. In order to achieve as seamless a transition as possible, new Sales & Marketing Director Tim Leigh has been working alongside Woody for the last six months in readiness for his departure. Simon leaves the business in very different shape to the one he founded; the breadth and depth of what we do is unrecognisable from thirty years ago. We wish him luck during his retirement, but expect him to drop by and see us regularly. With cake.